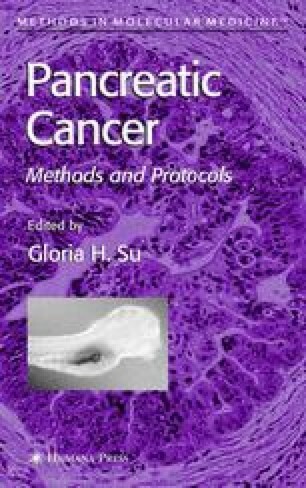 Elucidation of basic mechanisms that regulate pancreatic organogenesis may help define molecular pathways involved in the development of exocrine pancreas cancer. The zebrafish has emerged as a powerful model for genetic dissection of the mechanisms underlying vertebrate organogenesis including formation of the pancreas. Unique properties of zebrafish enable genetic and embryological analyses not feasible using other vertebrate model organisms. The optical clarity of the zebrafish embryos allows visual detection of markers for pancreatic morphogenesis and cytodifferentiation by whole mount immunohistochemistry and RNA in situ hybridization. This feature, coupled with the accessibility of the externally fertilized zebrafish embryo and the small size and fecundity of adult zebrafish, facilitates large-scale forward genetic screens using chemical or insertional mutagenesis techniques. Furthermore, these properties allow high throughput studies that target functions of known genes via antisense or enforced expression studies. Together, such studies are predicted to identify novel genes, or known genes essential for pancreas development. Work in zebrafish is predicted to complement research performed using other vertebrate model organisms, and may help identify markers that define early stages of pancreatic tumorigenesis as well as potential targets for therapy.